Environmental, Health and Safety News: The New Ethanol Blend May Damage Your Vehicle, increase food prices and will not decrease foreign oil use. The New Ethanol Blend May Damage Your Vehicle, increase food prices and will not decrease foreign oil use. "About 80 percent of the gasoline consumed in the U.S. is blended with ethanol, primarily with a 10 percent mix of ethanol, generally derived from corn. Now Kate Sheppard writes that the Environmental Protection Agency has approved a new policy that will allow states to raise the blend to up to 15 percent ethanol (also known as E15), approved for use for cars and light trucks from the model year 2001 and later. A few weeks ago, AAA issued a statement saying that the EPA's new policy creates the 'strong likelihood of consumer confusion and the potential for voided warranties and vehicle damage.' AAA surveyed vehicle manufacturers, and found that only about 12 million of the 240 million vehicles on the roads today are built to use E15 gasoline. 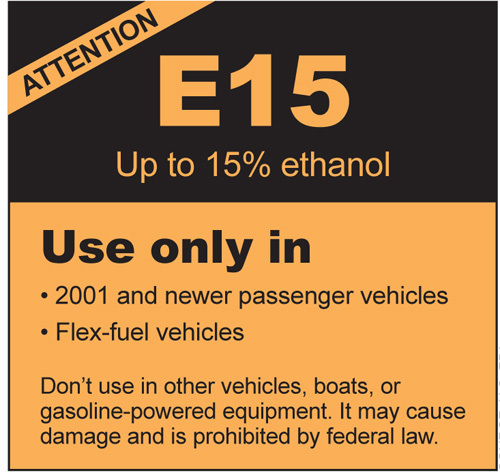 The EPA will require that gas pumps with E15 bear a warning sign noting the blend and that it is not recommended for cars older than the 2001 model year. But what happens if you accidentally use it? 'Nobody really knows what negative effects [E15 is] going to have on the vehicle,' says Brian Lyons, Toyota's safety and quality communications manager. 'We think that there needs to be a lot more study conducted to make sure there are no longer term effects on the vehicle. So far everything we've seen says there will be.' The concern is that repeated, long-term exposure could cause the higher-alcohol-content fuel to degrade engine parts like valves and cylinder heads — which could potentially cost thousands of dollars to replace. Gas station owners don't like it very much either, because they'd likely have to upgrade their equipment to use it. Nor are environmental groups big fans of the EPA's decision, arguing that increasing the use of ethanol can drive up food prices, and isn't the best means of reducing our reliance on foreign fuels. The ethanol lobby is theonly group that really seems to like the new rule. 'We've force fed a fuel into every American's car that benefits a few thousand corn farmers and ethanol refiners at the expense of virtually every other American,' says Scott Faber."